DEC has received a Brownfield Cleanup Program (BCP) application and Draft Remedial Investigation Work Plan from 441 Ohio Street, LLC for a site known as the 441 Ohio Street Site, site ID #C915285. This site is located in the City of Buffalo, within the County of Erie, and is located at 9 South Street. Comments regarding the application must be submitted no later than April 4, 2014. Click link at "Additional Information" above to learn how to comment. The application can be reviewed at: Buffalo & Erie County Public Library, 1 Lafayette Square, Buffalo, NY 14203. DEC has received a Brownfield Cleanup Program (BCP) application from Bilwin Development Affiliates, LLC for a site known as the Former Marble Quarry Landfill, site ID #C360143. The site is located in the Village of Tuckahoe, Town of Eastchester, within the County of Westchester, and is located at 109-125 Marbledale Road, 10707. Comments regarding the application must be submitted no later than April 4, 2014. Click link at "Additional Information" above to learn how to comment. 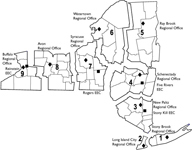 The application can be reviewed at: Tuckahoe Public Library, 71 Columbus Avenue, Tuckahoe, NY 10707. DEC has received a Brownfield Cleanup Program (BCP) application with Remedial Investigation Work Plan from 38-40 Purchase Corp. for a site known as the Former Belle Cleaners, site ID #C360086. This site is located in the City of Rye, within the County of Westchester, and is located at 38-40 Purchase Street. Comments regarding the application must be submitted no later than April 4, 2014. Click link at "Additional Information" above to learn how to comment. The application can be reviewed at: Rye Free Reading Room, 1061 Boston Post Road, Rye, NY 10580.